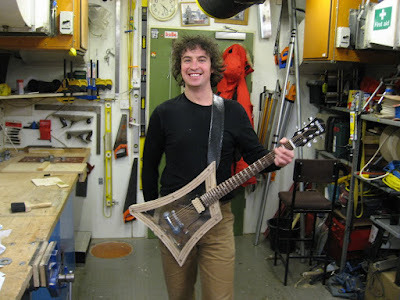 Antarctic Diary: The guitar is finished! Had a great weekend. Saturday was my Met Day, but as a visit to the CASLab was called for, we incorporated it in a pleasant run round the perimeter. We covered the 8ish Km in 52mins including a 10min stop, making a new record thanks to the firm snow. Hopefully we'll get it under 40mins as the light improves. Sunday was a good kiting day with many people venturing out for the first time since before winter. There's been a big buildup of snow forming wind-scooped trenches behind barrels to test the skills. A gentle 13knots blew from the east, but the hard snow made for quick enough riding. Unluckily Jules suffered an annoying skis-crossed-when-taking-off mishap meaning a nasty twist to his ankle and a trip to Richard's X-ray machine. 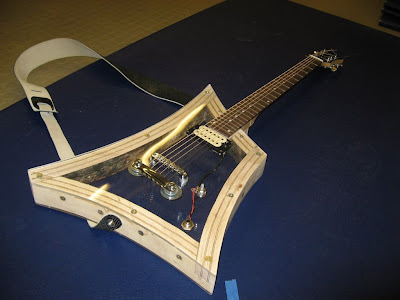 The world's only dog-sledge guitar? hi Dave, loving the guitar. good effort. though have to agree with skinny on the hair! Heulwen. Good effort my son. Hope all is well. Are you writing anonymous notes in support of your own hair, Dave? Don't you have a barber down there Dave? Let me know if you haven't and I will arrange to have one flown out to you as a matter of urgency.